“In leadership, there are no words more important than trust. This past Tuesday Mike Krzyzewski became the winningest coach in Division I college basketball history when Duke defeated Michigan State 74-69. This was Coach K’s 903rd victory in a 35 year career that has included four national titles, 11 Final Four appearances, and just four losing seasons. When Coach K references his players “letting him in,” he points to the heart. It’s not just a casual, conversational gesture. He’s making a specific point about tapping into his players’ heart – the emotional core of who they are as a person. Coach K intentionally focuses on developing a trusting relationship with each of his players because he knows without that absolute level of trust, he won’t be able to teach them how to transform their potential into performance. The same principle applies to leaders in any organization. In order to achieve success, you have to take the time to establish meaningful, trust-based relationships with your team members. If your people don’t trust you, they won’t be receptive to your coaching on ways they can improve their performance. If your team can’t trust that you’ll have their back when they fail, they won’t take the necessary risks needed to move your business forward. Conversely, trust enables your team to confront the brutal facts of their performance and find ways to get better. Trust allows individuals to set aside their personal ego for the betterment of the team and commit wholeheartedly to pursuing a common goal. Trust is what allows leaders to tap into the hearts and souls of their team members and achieve greater levels of success together than they could ever reach individually. Beyond the career milestones, and he’s had plenty, leading with trust is Mike Krzyzewski’s most enduring legacy. In that regard, we should all try to be like Mike. I really enjoyed this post for a few reasons, but most importantly, I enjoyed the whole theme of trust. I believe that it is absolutely pivotal to have trust in an organization and in our relationships as human beings in general. If you lead from the heart, and really allow yourself to be trusted by those around you, there is not stopping you from achieving your goals and helping others achieve excellence also. Coach K, especially with all of these scandals going on in this day and age, is a icon. For me though, after all of my heroes had been deemed untrustworthy because of cheating, steroids, affairs etc, it is hard to find people to trust…and people to look up to. Thank you Coach K for being one of those people for me who stands for greatness. Great post, I can’t wait to read the rest. Hi Evan. I appreciate your comments. It is hard to find good role models these days when it seems like every time you read the news there is another report of a well known leader involved in some sort of scandal. 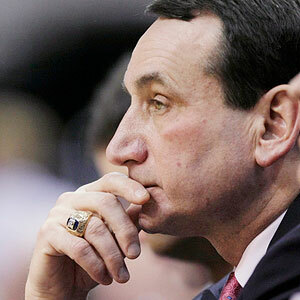 It seems as though Coach K is the real deal and we can learn some valuable lessons from his success. I checked out your blog and enjoyed reading some of your posts. Good on you for taking an introspective look at your daily experiences as you journey to becoming a better man. It’s a worthy journey for all of us.